I was searching the net for a solution how to boot and deploy an Ubuntu 10.04 LTS on a 3ware 9750 raid without having to load the 3w-sas.ko drivers manually for every server. It might be okay for s single installation, but this can really turn out to be a pita if it is a whole bunch of servers. From what I see there is only that modified 9.10 image provided by LSI, so please grab your copy for 10.04 amd64 here. Please keep in mind, with this installation you can not just upgrade your kernel without taking care of that driver, though. It’s a shame this driver didn’t find itself into the Ubuntu releases. Last evening I started relocation of all services from my old dedicated server to a vserver at another location. So I have to say bye bye old fellow, I am not going to miss you so much. But thanks anyways for (usually) being so reliable. These days I can have better performance for less money. And I can spent the money in things like pizza, beer and so on in our family money socks. Yeah! 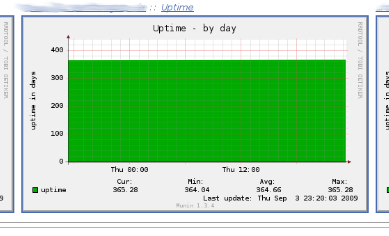 A few minutes ago – while I was dumpster diving the internet visiting that shiny Munin site we have once setup for some eye candy a more complete picture – I discovered the servers have today reached their first year uptime. In general that is nothing special, but well, this is our project. This thrills me and now it’s time for another 365+ days with keeping the engines running…cheers! Since a few weeks now I am in a new employer-employee relationship. I got a brand new Asus notebook. By accident I indeed booted M$ V1sta and cleanly restarted the computer. I then changed the BIOS password and was already happy to reboot, to enter the password and then install Debian GNU/Linux. The password??! It didn’t accept my password! Okay, after a few calls with the Asus customer support I really was very unpleased and we had to send this piece of cake back to the trader. I really can’t recommend the Asus support. That’s my personal experience. It’s now 4 weeks back we sent it in and we still didn’t get something back. So in the short term I got another Notebook, it’s a Sony Vaio VGN-FZ38M. Everything runs fine, the installation was straight forward and I had no glitches yet. It’s specs are something like Intel Core 2 Duo T8100, 4 GB RAM, 200GB HD, WLAN 802.1 a/b/g/n, 15.4 WXGA – 1280×800 (that’s one obvious minus point), a NVIDIA GeForce 8400M GT GPU, Firewire, USB, Bluetooth and a Blue-ray disc drive. The WLAN device required to fetch the driver from this intel page und to put it in the /var/firmware/ directory. My config fle for the network devices looks similar to the lines below, we have of course an encrypted WLAN and so I had to pass some more parameters to the config. This works for me, the screen resolution is sometimes a handicap and I would like a better battery uptime. But altogether this seems to be a good device without anything really ugly per my definition. For further information about linux on notebooks etc you might have a look at tuxmobil.org. EDIT: This notebook does not support Intel Vanderpool / VT technology ! This really is a big disappointment ! On Sunday we have been on a visit to my older brother and his family. Nerdy as I am I had our Sony Handycam with me on the trip and arrived back at home with plenty of new video footage. So I just wanted to make some videos available and digitalized and converted the dv source material from the camcorder with dvgrab and ffmpeg. So this is some kind of a minimal HowTo, hope this helps someone. If you are like me, you don’t like the idea to rely on 3rd party websites like younameit.xyz. There are a few good reasons to keep the video on your site – you have the physical control and you don’t need to accept confusing licence agreements. So here we go! First I piped the output of dvgrab directly from the firewire to ffmpeg. This deinterlaced, converted and scaled the dv file to something more useful for a web page. I think that the following options are fine, feel free to change them and of course make use of man dvgrab and man ffmpeg. Next I uploaded the example.flv file into the root directory of the domain. I use the open-source FlowPlayer Flash applet to actually embed the FLV video in my web page. I had to get a copy of the flowplayer.swf and flashembed.js from their page and copied the files to the root directory as well. And finally I added the following lines to the html page. That’s it. You should now have your video embedded in your page. Of course I love working on my dualcore workstation, crammed with 4 gigs of RAM and a rocket fast SATA Raid 0+1 mass storage. I really don’t complain. But the notebook I used on the road and on-site at customers had seen better days. So some weeks ago my employer agreed to buy me a new notebook. To make things short – I ordered the HP Compaq 6715b. It has a 1680×1050 screen resolution, a decent amount of RAM and an AMD X2 Turion Dualcore. The harddisk is quite okay, 250 GB SATA at 5400 RPM. I had to get rid of Windows Vista, so I took my freshly burned Debian Lenny weekly build CD and installed it. Lenny offers a pretty nice working environment. I didn’t use all the space availible, there has always to be playground for testing purposes. I already thought of installing OpenBSD and FreeBSD on the remaing space. So what is working and what is not? What were the pitfalls in the installation procedure? I was keen on changing the internal BCM 4312 802.11a/b/g Mini-PCIe WLAN device to something more functional. So I ordered from our wholesale dealer a Gigabyte AirCruiser G Mini-PCIe card with an Atheros chipset. But when I rebooted my computer I was suprised by the dreaded “104-unsupported wireless network device detected” message. It is possible to modify the bios and to insert some hex code to make it work, but I had better things to do. So now I am using the built in card via ndiswrapper and when I need more functionality I simply plug in an (Atheros) Orinoco Gold PCMCIA adapter. The fingerprint reader works fine, I tested it though I don’t need it. The release of FreeBSD 7.0 two weeks ago was just in time, I fetched the install images and went through the install procedure without any hassle. I haven’t installed the WLAN drivers yet, but the ndis tools are always red-hot in FreeBSD and so I expect it to function properly , too. In FreeBSD I use the radeonhd drivers, 2D desktop performace is fine. On FreeBSD 7.0 the sound is not working yet, but that’s for the time being fine. My xorg.conf and my pciconf -l -v in BSD. Altogether I think this notebook is recommendable. Its performance is all right, the display is very nice and bright. The casing doesn’t get too warm and the battery lasts up to three hours. If you need more information on notebooks running linux or unix, have a look at https://tuxmobil.org and don’t hesitate to submit your experience by yourself.